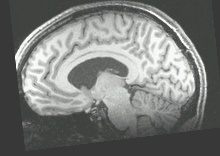 Yes, I assure you all, that is actually my brain. It would be interesting to get it scanned again after our trip to see just how many brain cells were lost. But finding a way to get paid to do it, as I did before, would be a bit more difficult. As I was walking to work one day I saw an add that stated “Cash for your brain!”. Being the curious human being that I am, I decided to take a closer look. “$50 for one hour of your time” it stated. Being a cash strapped recent grad I couldn’t resist, I decided to fire off an e-mail to see what it was all about. Shortly thereafter I received the following reply. them! Now its back home to everything that awaits me there! free” wireless just next to the University of Navarra’s new clinic. This being the location of Aita’s alma matter I figured it deserved a pic! Now off to see Pamplona when its not San Fermin! We did take some time to relax from all of the partying during the fiestas here by going to my family’s cottage in Las Landas – about an hour across the border of France. I did feel a bit guilty going into France after having celebrated their defeat by firing canons in their direction just the day before, but I got over it fairly quickly. Las Landas is a very unique place as it has a strange combination of pine trees and sand … EVERYWHERE. Just getting out of the car the smell of pine permeates the air. But there was something different about it – something sweet in the scent. After having slept until 5pm on the 9th we were to arrive at the cabin at 8pm. There was quite a thunderstorm brewing, which made for a spectacular light show that night! The following day we followed the thousands of rows of pines until we reached the sand dunes. It has been raining all day and it seems somewhat appropriate as the fiestas in Fuenterrabia have ended. This week has been crazy… filled with family, friends and long nights of partying! The best part about it is that it wasn’t expected at all. My plan for the trip to Spain was to relax after the exhausting trek through Europe, I should have known better! It has been absolutely non stop since I arrived here a week ago. First and foremost, catching up with family. It has been great to see everybody as well as having so much time to spend with them! They even convinced me to participate in the Alarde (the festival parade/march/reenactment) as can been seen in the picture above. There is no direct translation for the word Gaupasa – it basically means to be out all night until the sun comes up the next day. This tends to occur quite often during the fiestas in Spain, and last night was the first of what will probably be many Gaupasas for me here in Spain! The night started out with a dinner with my cousin Miguel and a bunch of his friends. We then met out at the marina and hit the bars. The mixed drinks are quite potent here and worth every cent of the 5 euro price! Although later on I was able to get a Redbull and vodka for 3.50 – by far the cheapest Ive ever paid for one! Suffice it to say, I was in rare form last night. When I finally went to bed at 7:30am I was quite worried about how I would feel when I woke up – but when I finally did at 2pm I was in much better shape than I had expected! The rest of the day was spent preparing for the parade tomorrow. Ill have to go into a detailed post about it at a later time. For now, sleep calls, as I wake up at 6:15 to get ready for the big event! From Geneva and back again. Granted I wasn’t along for the drive from Geneva to Paris (~500km) but the rest of the voyage the Puma, Matt and I survived! As you can see, the car is a little worse for the wear – given the fact that ~60 of those km where hard driving on the Nurburgring – and who knows how many kms we pushed it hard on the Autobahn. The remains of insects from 12 different countries are a testament to the Puma as well as our voyage. Whoever was up there looking after us as far as the weather during our voyage has now opened up the sky as a deluge of rain is starting to clean off the evidence of what has transpired. The car will never be the same again… and neither will its passengers. The countless stories that will be told are forever a part of the our past. The question is – will the next owner ever know?! Could they even possibly imagine? After quite literally being cut off at the pass to Interlocken – we decided to pass by the capitol of Switzerland, Bern. It is QUITE happening so we may actually decide to stay the night! Either way we will be in France by tomorrow morning. Gotta love the flexibility of a car!